Love 'em or hate 'em, you can't deny the New England Patriots drive the conversation more than any other team in the National Football League, and we have the data to prove it. The Super Bowl champions outpaced the rest of the NFL this preseason in digital engagements (that's a lot of talk about deflated footballs), according to data from analytics firm ListenFirst. 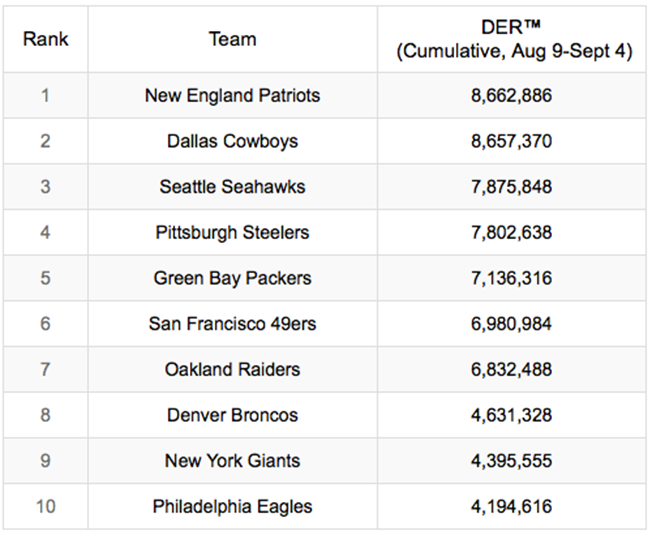 Per the company's Digital Engagement Rating, the Patriots—who kick off the season tonight against the Pittsburgh Steelers—accumulated 8.66 million engagements from Aug. 9 to Sept. 4., narrowly topping the Dallas Cowboys' 8.65 million engagements. 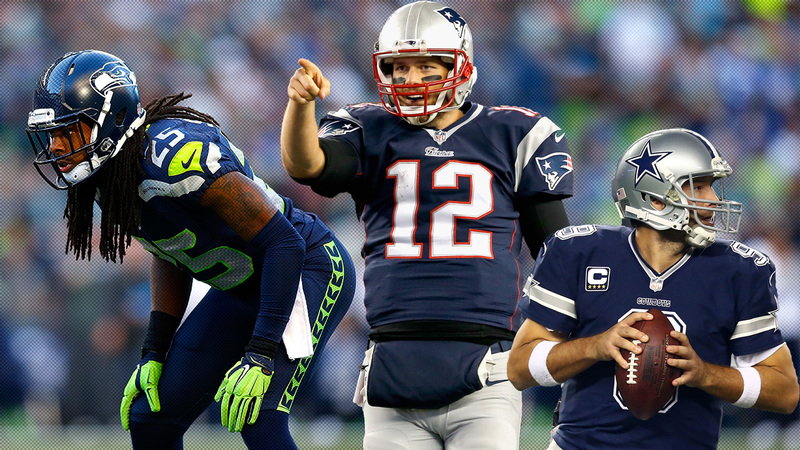 The Super Bowl runner-up Seattle Seahawks were third. ListenFirst's DER is a raw aggregate of daily engagements based on owned, earned and organic fan behavior on Facebook, Google+, Instagram, Tumblr, Twitter, Wikipedia and YouTube. These engagements encompass metrics pertaining to audience growth, pageviews and profile views, page-level and post-level interactions, hashtag volume, and Wikipedia pageviews. The Patriots only ranked first on two individual platforms—Instagram and Wikipedia—with the Cowboys topping most of the rest (the Raiders finished first on YouTube). But it was the Patriots' Instagram performance that propelled them to first overall, led by the Sept. 3 post shortly after Brady's four-game "Deflategate" suspension was overturned. The photo accumulated over 100,000 engagements in 24 hours, according to ListenFirst. "Instagram has proven to be an effective tool for the NFL brand as a whole," said Jason Klein, co-CEO and co-founder of ListenFirst Media. "During preseason, the NFL beat out brands such as Victoria's Secret and Mercedes Benz to earn its place as the leading brand on the channel." Despite being outside the top 10 overall, the Washington Redskins—who had their own share of controversy this preseason with quarterback Robert Griffin III's concussion mess—finished in the top three on Google+, Tumblr and YouTube. ListenFirst is a data and analytics company that aggregates data streams—including sales figures, customer engagement, research and tracking, media impact and social media platforms—to let brands know how they stack up against each other, glean insights into what's working and optimize business performance.